With the Olympic fever upon us it’s the perfect timing to go green, quite literally. This week we are introducing lush Brazilian Rainforest vibes to get you in the mood for the Rio Olympics. Green is a must have colour for 2016 summer interiors. It’s up to you if you want to go all out and turn your home into a lush greenhouse or keep a sophisticated minimalist look by adding just few subtle hints of this lively colour. Here are few suggestions on to make your interiors resemble a Brazilian Rainforest. Adding green accents to monochromatic interiors will create a tropical feel and bring the whole interior look to life. Coloured accent lighting and décor elements are great for sprucing up you interiors without making dramatic changes. Our Zany Table Lamp is a stylish solution for introducing green to your abode. It offers a soft ambience as well as serves as a style element. Another way to add colour to your room is by swapping the plain white lampshades for some freshly hued shades reminiscent of Brazilian Rainforest. Our 8 Inch Easy to Fit Shade in Sage colour will introduce a natural feel and create a cosy atmosphere. Tie it all together with monochromatic soft furnishings and masculine plants, such as Aloe Vera or a paradise Palm Tree. For a livelier look, choose vibrant jungle greens that will transform any room into a tropical rainforest. We absolutely love this eclectic industrial mix that will not only brighten your room, but also your mood. This distinctive look combines urban designs and sleek polished finishes that clash and complement one another at the same time. Exposed bulbs will create a laid-back urban atmosphere, while chic mirrors and gold accents will add a sense of sophistication. Our Decorative Light Cables combined with Exposed LED Filament Bulbs will create a show-stopping centrepiece in any room. Leaf green cushions and lots of tropical greenery will be like a cherry on top of a cake when it comes to this jungle look. Here’s a luxury take on the natural look for those of you who enjoy lazy Sunday mornings in bed and all things sumptuous. Start with the bedding to make sure you sleep like a royalty. Our Regency Range Throw will definitely add a sense of luxury to your bedroom. Take a look at the full range of Regency products here. When it comes to bedroom lighting, make sure it’s both practical and elegant. 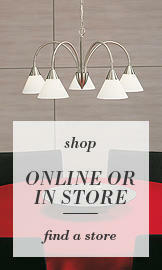 Our 5 Light Chisel Prism Bar Ceiling Light Pendant offers a bright ambience and has a contemporary design. The height of this fitting is adjustable to suit your needs. A matching table lamp will complement the overall look as well as create a relaxed atmosphere for when the main light is off. Of course, there’s no rainforest without the tropical plants, so don’t forget to find a nice place for a lush Philodendron or an Epipremnum. To sum it all up, there’s no need to run to the nearest DIY store and grab a bucket of green paint. 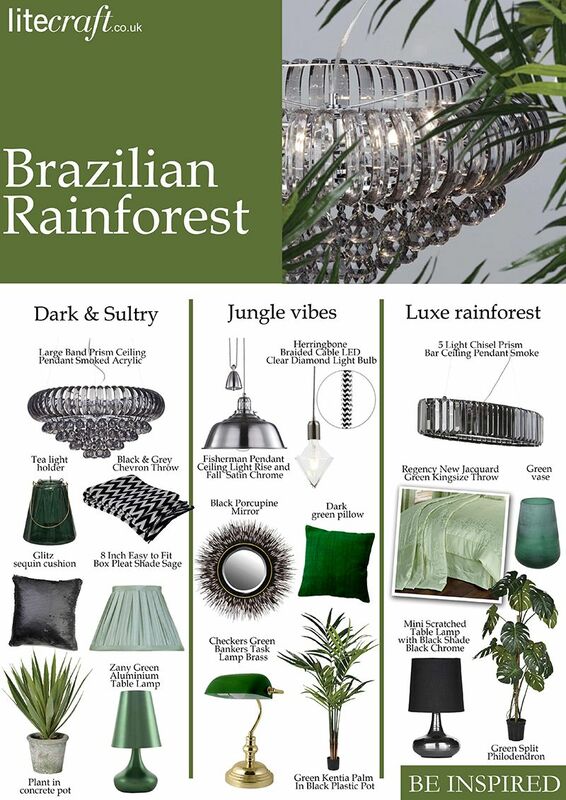 The Brazilian Rainforest look can easily be achieved by adding some new tropical plants and décor elements as well as upgrading your lighting. So what’s your favourite look? Let us know in the comments below.